Get ready for the next wave in chocolate making: bean-to-bar. Local pioneers Charley and Jessica Wheelock run the Woodblock Chocolate Manufactory out of their Southeast Portland home, and the results are impressive…pure and intense. 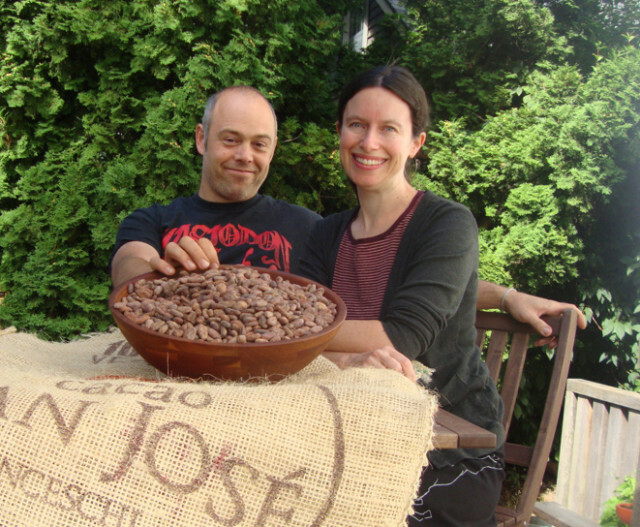 Production is still small, but this family venture already churns out two kilos of chocolate every 72 hours in the form of tiny, individually numbered, dark-roasted cacao logs. We caught up with Charley about what goes into making chocolate from scratch and where his company is headed. Is bean to bar the next DIY trend? As the craft chocolate movement grows, I think more precise definitions will form and categories will be made that fall under the bean-to-bar umbrella. There is some raw chocolate being made in town from the bean but as far as roasted cacao bean-to-bar chocolate goes, we seem to be a nose ahead of the pack. We are working on getting a brick and mortar space that will be very fun. We hope to create a small “manufactory” to showcase the chocolate making process to the public…but I don’t want to jinx anything. What inspired you to start making chocolate? It’s a combination of lifelong passion and some recent developments. Chocolate is art, science, design, craftsmanship, agriculture, mechanics, history, ritual. It’s social, it’s worldly—you can eat, drink, and mold it—you can use it instead of money! It’s a crazy commodity. The more we learn about it the deeper it gets. We chose the name “Woodblock” because we come from artisan backgrounds and find great joy in realizing the potential of a raw material; a woodblock is inspirational. How do you make chocolate from scratch? How is it different from the stuff other Portland chocolatiers make? Other chocolatiers make confections, bon bons and bars with chocolate they purchase from a chocolate maker. We source interesting beans from around the globe then sort, roast, crack and winnow, grind, conche, and age them with odd machines and hard work to produce our chocolate. In terms of taste and consistency, how is bean-to-bar chocolate different? Can you really notice a difference in flavor? The chocolate we all grew up on is essentially a product of the Industrial Revolution. The driving forces behind big chocolate are yield, shelf life, and cost. Big chocolate beats up the cacao from the beginning bean to final bar product. Crops are grown for yield, not flavor, and emulsifiers are added to save money and to accommodate the process. Our control over the entire process allows us to bring the best out of the bean. For example, we are working with a bean right now from the Dominican Republic that reminds me of a dog. A light roast brings out a fruity puppy who can get away with chewing up a slipper because she is so cute! The same bean with a heavier roast is the same pooch at 7 years old sitting on a rug by your feet, reliable and consistent and loving. A mature roast brings some sophistication and depth to the story of the flavor. It is exactly what you had hoped to end up with when you got the puppy in the first place. I know—this is ridiculous, right? But just changing one aspect of the process of one kind of bean yields remarkably different results. What do you usually indulge in when it comes to chocolate? Are you a Reese’s Pieces family or do you stick to a strictly 75-percent dark cocoa diet? I always grab a Twix when I am at the hardware store. Jessica is a little more discerning. I am guessing that my kids will probably eat Skittles through high school just to be rebellious in a town where it isn’t easy to be rebellious. You can buy Woodblock Chocolate bars at Cacao, the Meadow, Olympic Provisions, and Salt & Straw.